When it comes to making a cool movie, having good audio is every bit as important as good video. Sound plays such a valuable role in video storytelling that you will want to make sure you go back and watch your movie all the way through; adjusting audio levels when necessary. 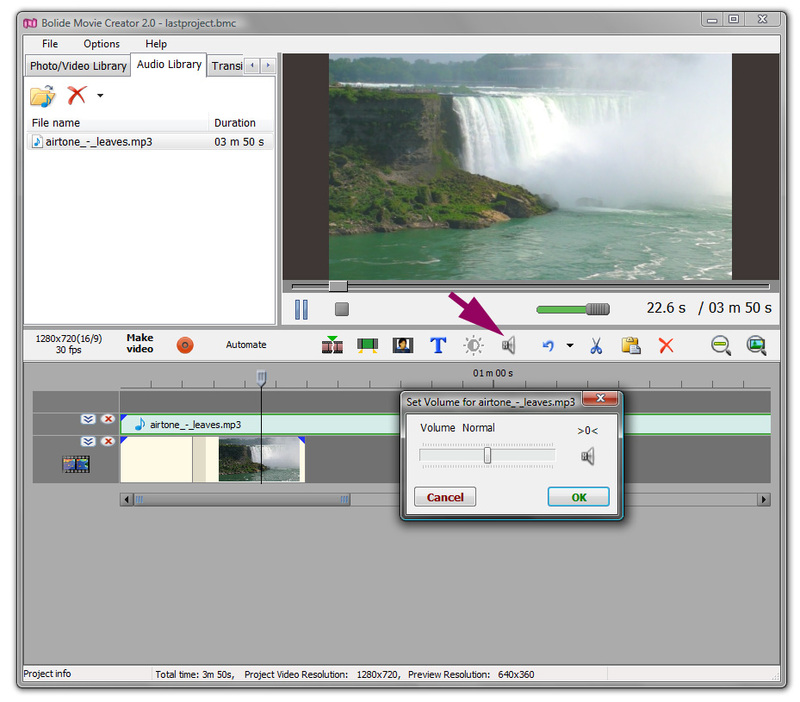 With the Bolide Movie Creator, you can increase/decrease volume or mute the selected audio clip. Begin by adding an audio clip to your project timeline (the audio clips associated with your project are kept in the Audio Library). Simply drag & drop the audio clip onto your timeline. Next, click the Adjust sound for selected fragment icon on the main toolbar. This will open the Set Volume interface for your audio (or video) clip. Note: you can also access the Set Volume interface by right-clicking the audio clip on your timeline and selecting Adjust sound from the menu. From here you can slide the cursor along the bar to increase (right) or decrease (left) the audio level of your clip. Click the speaker icon in the Set Volume interface to toggle sound on/off. Click >0< to undo changes and reset your audio clip volume back to its original volume.